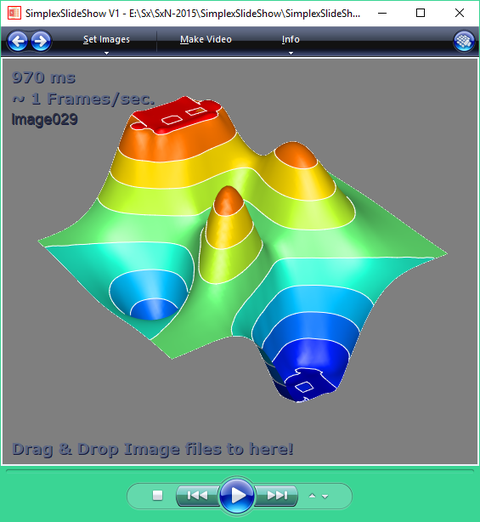 Simplex Slide Show - simplexnumericas Webseite! Simplex Slide Show is a simple Windows application that you can use to view images and play slideshows. It offers support for multiple types of photos and gives you the possibility to control the on-screen duration of each image within a slideshow. Setting up this tool doesn't take long. The only notable aspect about it is that it cannot run without Microsoft Visual C++ 2015 Redistributable (x86). Unless you already have it, you can start its immediately installation right after the Simplex Slide Show setup. As far as the interface is concerned, the photo viewer has a familiar feel to it. It borrows some classical elements from Windows Media Player to make the whole experience as straightforward as possible. There are no special configuration settings available, so the matter comes down to specifying a folder with multiple images and starting the slideshow with the click of a button. When it comes to the filetypes, Simplex Slide Show can display PNG, JPEG, BMP, DIB, GIF, TIFF, WMF, EMF and ICO. Unfortunately, it cannot load a folder with all supported photos at the same time. Instead, you have to pick a preferred filetype to instruct the tool to load only matching photos. The filename of each photo is show in the main window, next to the image. Furthermore, you can change the elapse time from a menu, pause and resume the slideshow, go to the next or previous image in the specified folder by clicking a couple of buttons, as well as increase or decrease the elapse time by clicking two arrows in the controls menu. It worked smoothly on Windows 10 in our tests. The only time it popped up errors was when attempting to play unsupported images. Otherwise, Simplex Slide Show turns out to be a simple and straightforward slideshow player for users not interested in rich and complicated features. You can do that with any picture gallery if you like. Simply, Drag & Drop your pictures into the app and let it run.